For the English footballer, see Samuel Bellamy (footballer). "Robin Hood of the Sea"
Captain Samuel Bellamy (c. February 23, 1689 – April 26, 1717), later known as "Black Sam" Bellamy, was an English pirate who operated in the early 18th century. Though his known career as a pirate captain lasted little more than a year, he and his crew captured at least 53 ships under his command – making him the wealthiest pirate in recorded history – before his death at age 28. Called "Black Sam" in Cape Cod folklore because he eschewed the fashionable powdered wig in favor of tying back his long black hair with a simple band, Bellamy became known for his mercy and generosity toward those he captured on his raids. This reputation earned him another nickname, the "Prince of Pirates". He likened himself to Robin Hood, with his crew calling themselves "Robin Hood's Men". Bellamy was the youngest of six known children born to Stephen and Elizabeth Bellamy in the parish of Hittisleigh in Devonshire, England, in 1689. Elizabeth died soon after, and was buried on February 23, 1689, three weeks before Samuel's baptism on March 18. The future pirate became a sailor at a young age; in his late teens, he joined the Royal Navy and fought in several battles. Though it has been speculated that he may have had a wife and child, there is no definite historical proof of this. Bellamy traveled to Cape Cod around 1715, allegedly to seek some of his relatives there. According to an abundance of local lore on the subject, it is believed that he took up an affair with a local beauty, Goody Hallett — the "Witch of Wellfleet". Professor Elizabeth Reynard, in her 1934 book, The Narrow Land, gave her the name "Maria", and though there is no evidence of her bearing that name, it has nevertheless become a popular name for her. Other modern authors have called her "Mariah" and "Mary". Her age and marital status remains a subject of much debate. Some stories depict her as a young lady between 16 and 25, while others depict her as a very old woman. In some stories, her parents liked him, but didn't think a poor self-confident sailor was husband material; circumstantial evidence indicates that she may have already been married, confirming some stories that it was Bellamy's intent to seek his fortune and then return, not to marry her, but to take her away. For whatever reason, he left Cape Cod in early 1716 with a group of men to seek the vast treasures on the Florida coast from the Spanish wreck of the 1715 Treasure Fleet. Wealthy jeweler Palgraves Williams (also recorded as Palsgrave, Paulgrave, Paulgraves, Paulsgrave and Paul), son of Rhode Island Attorney General John Williams, joined Bellamy and funded their expedition. After Bellamy left the Cape, Hallett was found to be pregnant by Bellamy. It is said that she gave birth to a son and hid the child in a barn for warmth while she foraged for food; and when she returned she found that the child had choked to death on the straw. Some legends say that it was the barn of the notable Knowles family, others claim it to be that of Justice Joseph Doane who had banished her. In either case, she was arrested for the child's murder and imprisoned in Barnstable Gaol (the oldest wooden jail house in the United States; said to be haunted by her). Her sentence was relatively short, but she was exiled from the town. Even after that, she still waited for him in Eastham. The treasure hunters apparently met with little success, as they soon turned to piracy in the crew of pirate captain Benjamin Hornigold, who commanded the Marianne with his first mate, the soon to become famous Edward "Blackbeard" Teach. In the summer of 1716, the crew became irritated by Hornigold's unwillingness to attack ships of England, his home country. By a majority vote of the crew, Hornigold was deposed as captain of the Mary Anne and left the vessel with his loyal followers, including Teach. The remaining 90-man crew then elected Bellamy as captain. Upon capturing a second ship, the Sultana, it was made into a galley, and with approval of the crew, Bellamy assigned his friend Palsgrave Williams as its commander. However, Bellamy's greatest capture was to come in the spring of 1717, when he spotted the Whydah Gally (pronounced "WID-uh") sailing through the Windward Passage between Hispaniola and Cuba. Built in England in 1715 as a state-of-the-art, 300-ton, 102-foot-long (31 m) English slave ship with 18 guns (cannons), and with speeds of up to 13 knots (24 km/h; 15 mph), the Whydah was on its maiden voyage in 1716 and had just finished the second (Africa to Caribbean) leg of the Atlantic slave trade, loaded with a fortune in gold, indigo, Jesuit's bark, ivory and other precious trade goods from the sale of 312 slaves. Bellamy chased the Whydah for three days before getting close enough to fire. After a single shot, Captain Lawrence Prince surrendered the Whydah by lowering its flag. True to his reputation for generosity, Bellamy rewarded Prince's lack of resistance by trading the Sultana for the Whydah. Removing the captain's quarters and upgrading the ship to 28 guns, Bellamy turned his new flagship northwards along the eastern coast of the Carolinas and on to New England. "He made a dashing figure in his long deep-cuffed velvet coat, knee breeches, silk stockings, and silver-buckled shoes; with a sword slung on his left hip and four pistols on his sash. Unlike some of his fellows, Bellamy never wore the fashionable powdered wig, but grew his dark hair long and tied it back with a black satin bow." As captain, his leadership style was almost democratic. His crew was very fond of him, sometimes even referring to him as "Robin Hood of the Sea" and themselves as "Robin Hood's Men". Captain Bellamy was also a good tactician. Usually, he had two ships under his control. His flagship was powerful with many cannons and the second one was light but fast, which made a good balance. With coordinated attacks, they managed to capture ships easily without harming them. Silver recovered from the wreck of the Whydah. Forbes Magazine ranked Bellamy #1 in its list of "Top-Earning Pirates". "You are a devilish conscience rascal! I am a free prince, and I have as much authority to make war on the whole world as he who has a hundred sail of ships at sea and an army of 100,000 men in the field; and this my conscience tells me! But there is no arguing with such snivelling puppies, who allow superiors to kick them about deck at pleasure." Just two months after acquiring the Whydah, as she and the Marianne approached Cape Cod, Williams told Bellamy that he wished to visit his family in Rhode Island, and the two agreed to meet up again near Maine. If Bellamy intended to revisit his lover Maria Hallett, he failed. The Whydah was swept up in a violent nor'easter storm off Cape Cod at midnight, and was driven onto the sand bar shoals in 16 feet of water some 500 feet from the coast of what is now Wellfleet, Massachusetts. At 15 minutes past midnight, the masts snapped and drew the heavily loaded ship into 30 feet of water where she capsized and quickly sank, taking Bellamy and all but two of the Whydah's 145-man crew with her. One hundred and three bodies were known to have washed ashore and were buried by the town coroner, leaving 41 bodies unaccounted for. The Mary Anne was also wrecked that night several miles south of the Whydah, leaving seven more survivors. All nine survivors from the two ships were captured and prosecuted for piracy in Boston, and six were hanged in October 1717 (King George's pardon of all pirates, issued the previous month in September, having arrived in Boston three weeks too late). Two were set free, the court believing their testimony that they had been forced into piracy. The last, a Miskito Indian from Central America, John Julian, is believed to have been sold into slavery to John Quincy, the grandfather of U.S. President John Quincy Adams. 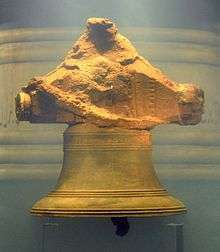 The bell, inscribed, "THE WHYDAH GALLY 1716". In July 1984, Bellamy became famous again when the discovery of the wreckage of his flagship Whydah was announced, and would soon become the first authenticated pirate shipwreck ever discovered in North America. At the time of its sinking, the Whydah was the largest pirate prize ever captured, and the treasure in its hold amassed roughly 4.5 to 5 tons, including huge quantities of indigo, ivory, gold, and 20,000 to 30,000 pounds sterling, divided into 180 sacks of 50-pound (23 kg) each. The discovery of the wreck was made in 1982 by a diving crew led and funded by underwater explorer Barry Clifford. The vessel was under just 14 feet (4.3 m) of water and 5 feet (1.5 m) of sand. In 1985, Clifford recovered the ship's bell upon which were the words "THE WHYDAH GALLY 1716", the first incontrovertible evidence of his find. He subsequently founded The Whydah Pirate Museum on MacMillan Wharf in Provincetown, Massachusetts, dedicated to Samuel Bellamy and the Whydah. It houses many artifacts which were brought from the actual wreck, including a cannon found to be stuffed with precious stones, gold and artifacts. A portion of the some 200,000 artifacts so far recovered are currently on a six-year tour around the United States under the sponsorship of The National Geographic Society. see: P. N. Furbank and W.R. Owens (1994). Defoe De-Attributions : A Critique of J.R. Moore's Checklist. London: Hambledon Press. ISBN 1-85285-128-7. The Way of the Pirates, "Famous Pirate: Samuel Bellamy, The Romantic Pirate"
↑ "Top-Earning Pirates". Forbes. 2008-09-19. Retrieved 2015-10-14. 1 2 3 4 5 "Capt. Samuel Bellamy, Rogue Romeo". National Geographic. Retrieved 26 May 2015. ↑ Woodard, Colin (2007). The Republic of Pirates: Being the True and Surprising Story of the Caribbean Pirates and the Man Who Brought Them Down. New York: Harcourt. pp. 28–29. ISBN 978-0-15-603462-3. ↑ "The Whydah Museum". The Whydah Museum Official Site. Historic Shipwrecks, Inc. Retrieved 8 October 2012. ↑ Brunelle, Kathleen (2011). Bellamy's Bride. The History Press. ↑ Fitzgerald, Michael (1912). 1812: A tale of Cape Cod. The Register Press. ↑ Kincor, Kenneth J. Whydah source book. Whydah Pirate Museum. ↑ "The Pirate Ship Whydah: Pirate strategy". "Real Pirates" museum exhibit website. Chicago, Illinois: The Field Museum. 2009. Retrieved 21 January 2013. 1 2 3 4 5 6 Dow, George Francis; Edmonds, John Henry (1923). The pirates of the New England coast, 1630–1730. Argosy-Antiquarian. pp. 116–131. Retrieved 26 May 2015. ↑ Woodard (2008), pp. 156–158. ↑ "The Slave Ship Whydah: A Slave-Based Economy". "Real Pirates" museum exhibit website. Chicago, Illinois: The Field Museum. 2009. Retrieved 12 October 2012. ↑ Tattersall, Jill. "Black Sam Bellamy". British Virgin Islands Welcome. British Virgin Islands: BVI Welcome Tourist Guide. Archived from the original on 31 December 2012. Retrieved 20 January 2013. ↑ Snow, Edward R. (1946). Great Storms and Famous Shipwrecks of the New England Coast. ↑ Dow, George Francis (1988) . Every Day Life in the Massachusetts Bay Colony. Courier Dover Publications. p. 221. ISBN 0-486-25565-4. ↑ "The Whydah's Loss: The Pirate's Trial". "Real Pirates" museum exhibit website. Chicago, Illinois: The Field Museum. 2009. Retrieved 21 January 2013. 1 2 Commonwealth of Massachusetts v. Maritime Underwater Surveys, Inc. , 403 Mass. 501 (Mass. Supreme Court 1988). Clifford, Barry; Perry, Paul (1999). Expedition Whydah : the story of the world's first excavation of a pirate treasure ship and the man who found her (1st ed.). New York, NY: Cliff Street Books. p. 261. ISBN 9780060929718. Clifford, Barry; Turchi, Peter (1993). The pirate prince : discovering the priceless treasures of the sunken ship Whydah : an adventure (1993 Hardcover ed.). New York: Simon & Schuster. ISBN 9780671768249. Woodard, Colin (2008). The republic of pirates : being the true and surprising story of the Caribbean pirates and the man who brought them down (1st Harvest ed.). Orlando, Fla.: Harcourt, Inc. pp. 28–29. ISBN 978-0-15-603462-3.